It is only in comparatively recent times that it has become common in England to provide town dwellings for the middle classes in the form of flats; but now comparatively few separate houses are built, and flat dwelling is customary. The principal reason for this is to be found in the economy of service which is effected, there being fewer servants required for a family living in a flat than for one living in a house, together with the convenience of being able to shut up one's residence and go away at any moment by merely locking the door. Of course, it is rarely possible for a person to own the freehold of a single flat, although this was done in some cases a hundred years ago; but in large towns few persons own their own houses, and the sentimental objection to sharing a house with other people is by no means so strongly felt as it is in the country. Upon the comparative advantages of flat and house living there is a good deal to be said on both sides, but this is hardly the place to enter into the matter. The general difficulties of flat planning are considerable, and different from those to be met with in ordinary house planning. It is necessary to provide accommodation for an entire family upon a single floor without, as a rule, having a large area of ground at disposal. Frequently economics of space are necessary which are rather suggestive of a ship's cabin than of a dwelling-house, yet it is possible with care to produce comfortable and even cosy dwellings, well lighted and cheerful. This, however, can only be done by the exercise of ingenuity, and the majority of the smaller flats, or maisonettes, as they are frequently called, are unsatisfactory upon almost all grounds. Fig. 16, for instance, illustrates a type of plan which has been followed largely in South London. The primary object here has been to crowd as many flats as possible on to a small frontage, and every possible advantage has been taken of the provisions of the London Building Act, which considers a series of dwellings whose party walls are not more than 40 feet from centre to centre, and are served by a common staircase, to be a single house. Thus each 40 foot frontage has an entrance hall and staircase in the middle, which is common to the inhabitants of all the flats, of which it serves two upon each floor, separated from one another by a long party wall. Each flat has therefore a frontage of only 20 feet, which allows of but one room being placed in the front and one at the back, except by extending in the form of a back addition. This is done as a matter of course with the result that the space between the long back additions is itself long and narrow, and the rooms extremely small, the passage being almost without light or ventilation. The living room is in the front, with the largest bedroom immediately behind it - and that is not very large. It is followed by another small bedroom, whose window looks directly into the window of the similar room in the next back addition. Beyond that are found a bathroom and larder, and then the kitchen, out of which open, at the back, the scullery and small coal store, with a way out to a garden, either direct or down a flight of iron stairs which serve as an emergency exit from the upper floor in case of fire. The narrow yard or space between the back additions forms the garden of the ground-floor suite, while any yard at the back is appropriated by the people who live on the first floor. Usually these flats are only of two storeys, but often they are higher, when the long narrow space between the back additions is even more objectionable. It is into this space that both the bedrooms and the kitchen have their outlook, directly facing similar rooms in the neighbouring tenement, with scarcely the possibility of direct sunlight. The living room in front is, in fact, the only one which is well lighted, and it is usually spoilt by careless placing of the door, window, and fireplace. 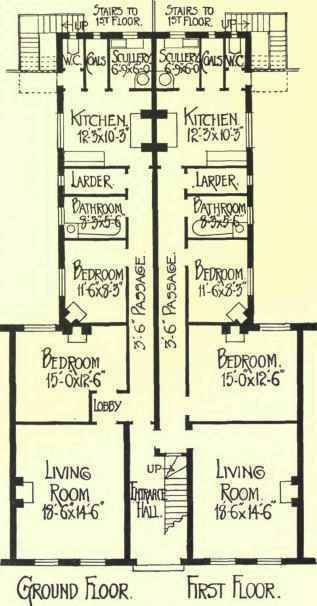 This type of plan is illustrated rather because it is in common use than in order to recommend it. All the internal walls may very well be formed of one of the modern patent thin partitions in order to economise space. The spans are not great, and ordinary floor joists can easily be carried, though it is more usual to introduce some simple form of fire-resisting floor. Little flats of this sort can be worked without servants, and although the rents are somewhat high, economy is effected by living in them. This is perhaps the general reason for their being so largely built as they are at present. When the primary object is not extreme economy it is, however, possible to produce comfortable and satisfactory dwellings on the flat system. Such is the flat, No. 9 Russell Mansions, in Southampton Row, Bloomsbury, illustrated in Fig. 17, which shows the plan of one of the upper floors. The lift occupies the staircase well, as is usual in English work, and is reached by a passage on the ground floor from the street, and passes from that level up to the top of the house, the basement being occupied by a similar house to the others, occupied by the caretaker, who manages the lift and looks after the coals, for which there are separate cellars for each flat. The lift is large enough to accommodate passengers and luggage, and at each floor comes to rest upon a landing out of which open what may be called the front doors of a pair of flats. These lead into a large hall, which can be furnished as a sitting-room if desired, although out of it two large rooms open in the front as drawing-room and dining-room respectively. The hall is lighted from an area, while a larger area serves to light the staircase and lift. A passage passes from the hall towards the back, leading to a large kitchen with a scullery attached to it and a small coal store on one side, and to a servant's bedroom and a bathroom on the other; and, being continued, provides means of access to three more bedrooms in the rear, two of which have bay windows and a pleasant outlook over some gardens, while the third is a mere small, supplementary room lighted from the main area. A good deal of thought has been expended upon the details, with the result that it is really a comfortable house on a single floor, suited to a family of moderate size, and capable of being worked by a single servant. Were the same accommodation provided in a detached house it is certain that from two to three servants would have to be kept.